I’m not going to tell you about my landlord selling our house, or how we’ve spent copious amounts of time looking for a new home. I’m not going to tell you about all the packing and sorting and cleaning to be done. No I won’t tell you any of that. Instead, let me tell you about this delicious, wholesome salad with roasted pumpkin, goats cheese, fresh basil and freekah. 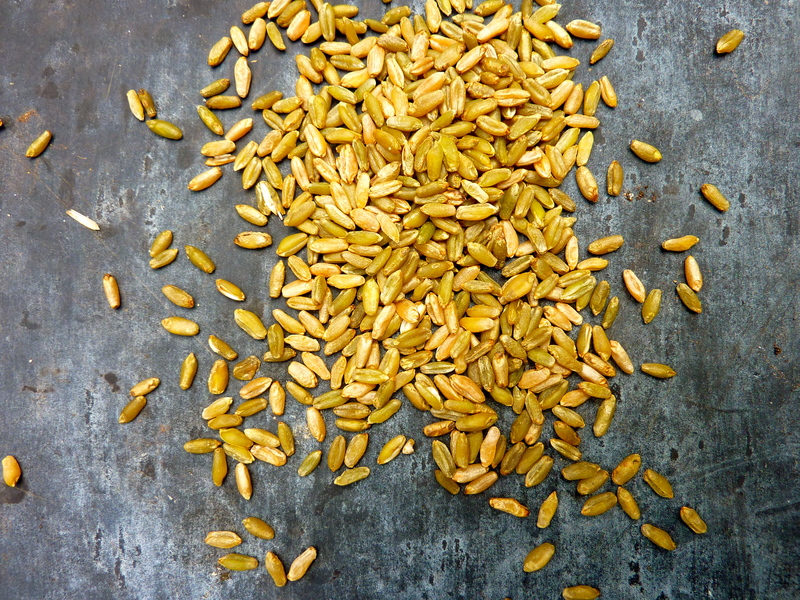 Freekeh, if you’re yet to be acquainted, is young green wheat that’s processed and dried by roasting over an open flame. It has a nutty, smoky flavour, with a firm (much firmer than pearl barley) chewy texture. It’s brilliant cooked and served cold in salads, as you might brown rice. It’s nutritious too and high in fibre. And for the sake of convenience, supermarkets are now stocking this delicious grain. You can also buy freekah cracked, which cooks much faster and doesn’t require soaking over night – not that I soaked the freekah for this salad (see recipe for fast track cooking) – there’s far too many boxes piling up to be that organised! This is the gorgeous basil I have growing in my back garden, and the one I picked fresh for this salad. I can’t take credit for being the grower, that would be my green thumbed man, he’s very handy in the garden. I chopped the basil back two weeks ago and made fresh pesto to eat with linguini and already it’s screaming out to be used again. 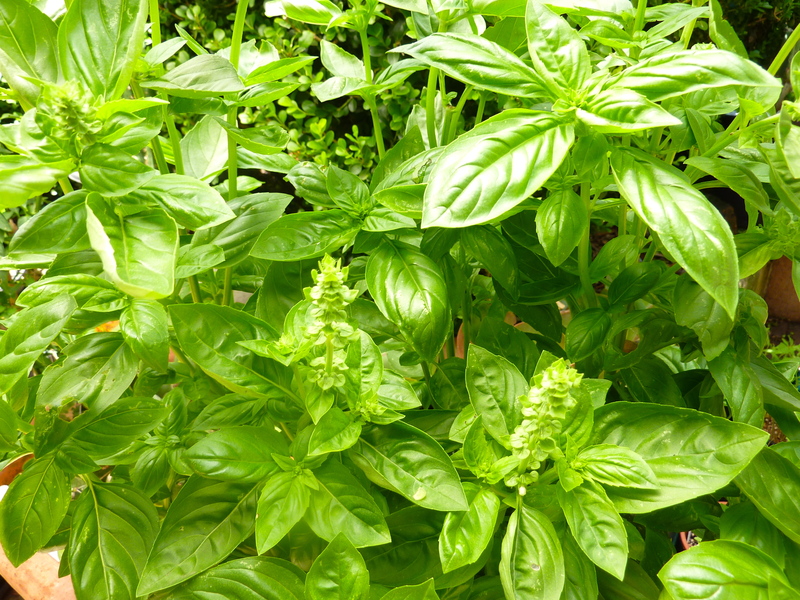 Now of course, not everyone will have access to basil from their own back yard, that’s fine. My tip is to smell the basil before you buy it. It should be pungent and have an almost over powering perfumed smell, if it smells of freshness and sweet summer then it’s good to buy. The dressing for this salad uses roasted caraway and mustard seeds. Caraway seeds have a flavour similar to star anise and fennel and are often used to flavour rye bread. Roast and pound the seeds, in a mortar and pestle, together with vinegar and extra virgin olive oil, sea salt and cracked pepper. Now, the goats cheese crumbled over the top gives the creaminess this salad requires – the fresh basil – the lightly caramalised onion – its all top shelf. I love eating this salad with a good sourdough bread, or it’s also excellent served with a grilled steak or barbecued lamb cutlets. Soak freekeh in cold water over night. Cook in a medium pan with plenty of water for about 45 minutes. Or if you forget to soak freekeh, cook in plenty of water for 1 hour, turn off the heat and stand in the hot water for a further 30 minutes. Drain and rinse, set aside to cool. Pre heat oven to 200C or 180C fan forced. Peel and cut pumpkin into 2cm dice, place in a baking tray with sliced red onion, chopped thyme, a drizzle of olive oil, sea salt and black pepper, mix together with your hands and roast in the oven for 40-45 minutes, stir once during cooking. Set aside to cool to room temperature. For the dressing, place caraway seeds and mustard seeds in a small fry pan, toast in a dry pan till seeds start to pop. Place in a mortar and pestle and pound to a rough powder, add vinegar, extra virgin olive oil, a pinch of sea salt and a large crack of pepper, whisk to combine. 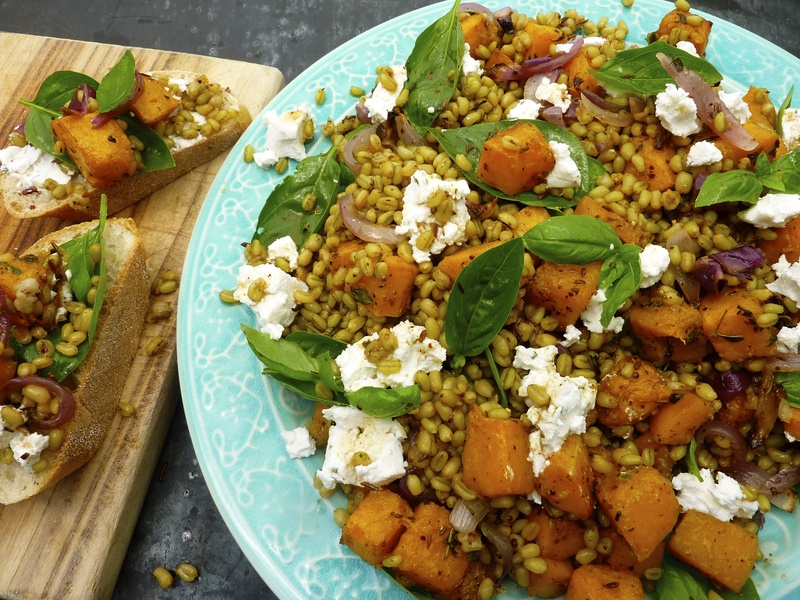 Pour the dressing over the cooked freekeh and toss to combine, add cooled roasted pumpkin, and picked basil, toss gently to combine. Place on a large platter and sprinkle with crumbled goats cheese. Eat with good sourdough. Thanks Catherine. How clever of you being able to post in two languages, bravo! Looking forward to your future posts. Sorry wouldn’t have a clue how to get listed on Yahoo news. This is news to me that my blog is listed there. The internet has a mind of it’s own and I’m not sure I’ll ever understand how it works! Glad you like my blog. Hi Michelle! 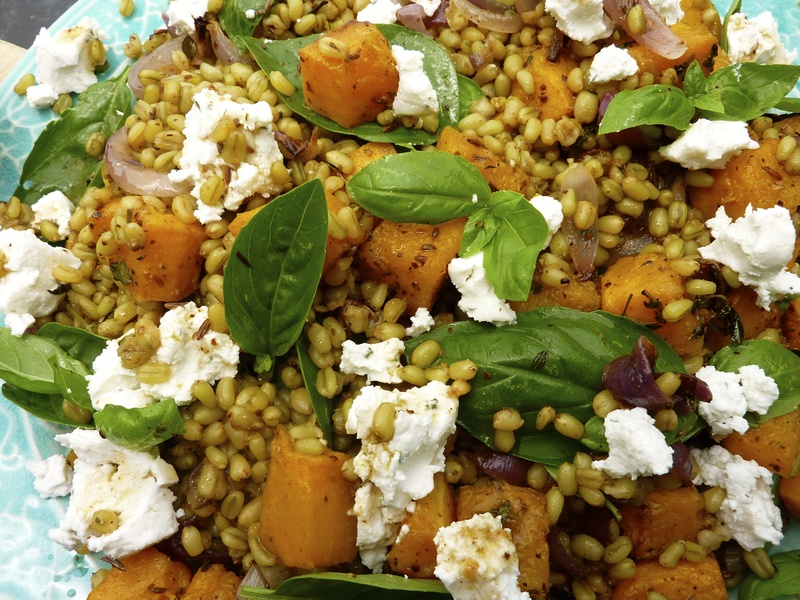 We LOVE the freekeh image and have featured this in an article for a new food website. Please get in touch with us for more details – editorial.homemade@gravityroad.com. Thanks!